MuxLab has recently introduced its new on-board CMS system, DigiSign, at ISE 2019. This software, compatible with the MuxLab’s Digital Signane Media Player (model 500769), supports streaming content with H.264/H.265 codecs through local Ethernet, Internet, memory drive or external USB 3.0. Its available for iOS, Android and Windows. 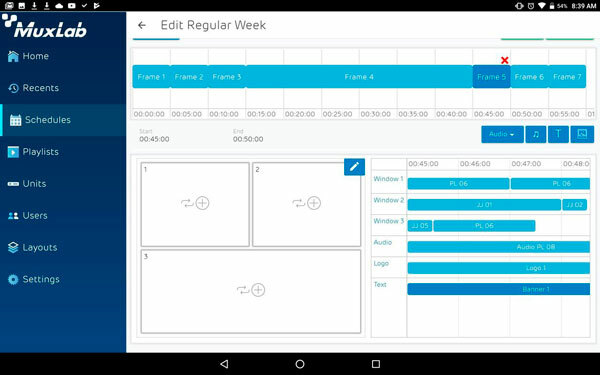 DigiSign permits technicians to schedule content autonomously for a week, including the possibility to automatically play additional weeks with its “set and forget” functionality. Another highlight of the software is the multi-view window layout feature, with audio, video, images, text banners and logo customization support. Last, but not least, content (with a video output up to 4K60Hz (4:4:4)) can be played simultaneously from different sources. The combination of DigiSign and the MuxLab’s Digital Signane Media Player can be boosted for its utilization on virtual matrix solutions or video walls configurations with the use of a MuxLab AV over IP transmitter.